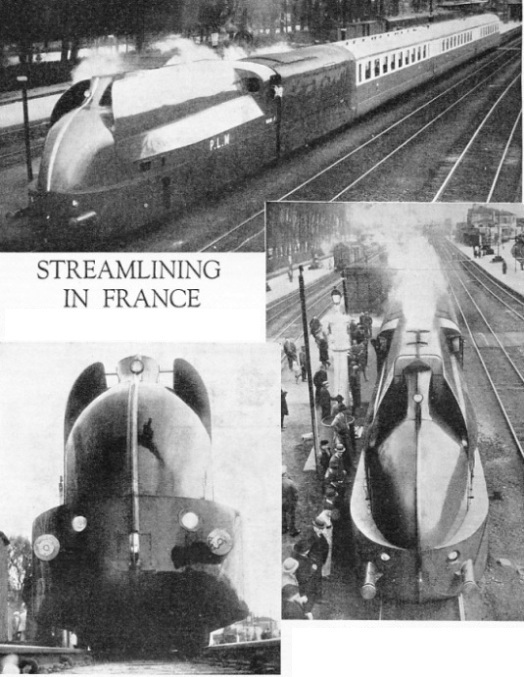 A NEW STREAMLINED TRAIN of special design, tried out on the Paris, Lyons and Mediterranean Railway. A twenty-seven-year-old locomotive was used, and was experimentally covered with steel plating of streamlined shape. AN INTERESTED CROWD is shown inspecting the streamlined train. The plates are arranged to conceal the wheels and the spaces between the three carriages used on the test run. In April 1935, this PLM streamlined train is claimed to have attained a speed of 100 miles an hour between La Roche Migennes and Paris. The PLM owns the largest railway system in France, and, apart from this test, all its services have recently been speeded up, and subjected to general improvements. AN UNDER-SIDE VIEW of the streamlined engine. You can read more on “The Rail-Cars of France”, “Speed Trains of Europe”, and “Through Southern France” in Railway Wonders of the World.